Travel is a great way to teach children about the world. 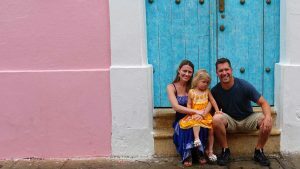 Through travel, we’ve been able to introduce our daughter to the many different cultures, people, and ways of life that make this world great. And even when we aren’t traveling, we like to feed our child’s curiosity with toys, books, and other items that fuel her love for the world. 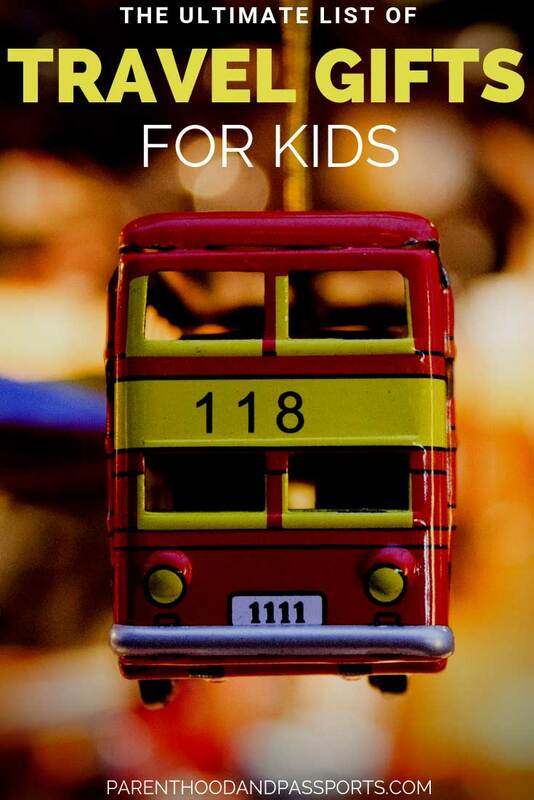 We’re constantly looking out for travel-inspired gift ideas for kids. We’ve created a list of the best travel gifts for kids of all ages that your little globetrotter will be sure to love! 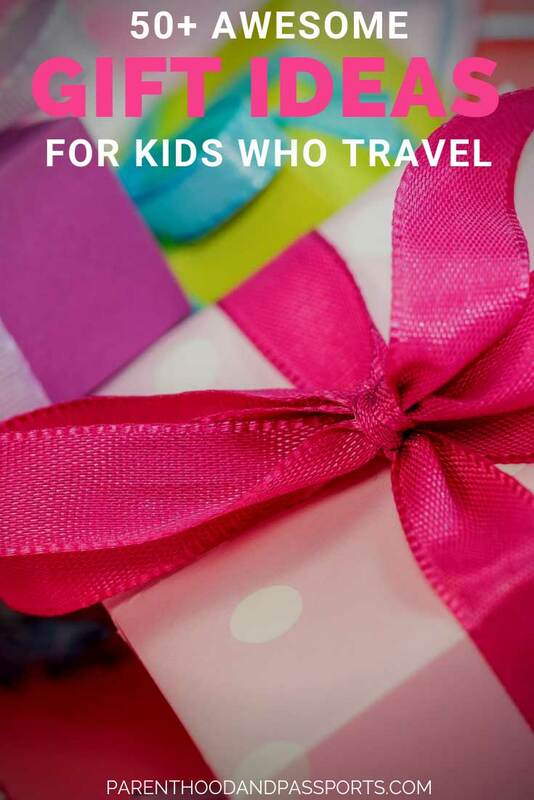 To help you find the perfect present for your young traveler, we’ve broken this list into several categories and created a table of contents to take you directly to the category that is best suited for your child’s age and interests. Travel doesn’t have to stop when you have a baby. In fact, why not start developing a love for travel as soon as your little one is born? These travel gifts for babies are sure to start molding your tiny traveler’s wanderlust from the very start. When our daughter was a baby, she had a travel-themed nursery. And while this mobile is more geared toward a boy’s nursery, it definitely fits the travel theme. You can also find lamps, blankets, and artwork to match this cute airplane-themed nursery. Prepare your baby for all the exciting sounds of travel with this fun and entertaining toy. Just press a button and the toy makes landing, flight and take-off noises that will have your tiniest traveler fascinated. We all remember and love the popular book Goodnight Moon. This short, easy-to-read board book features a variety of different planes and will inspire a love for airplanes and airports at an early age. Let your baby’s first outfits tell the world they’re going to be a traveler with adorable travel-themed onesies and outfits. 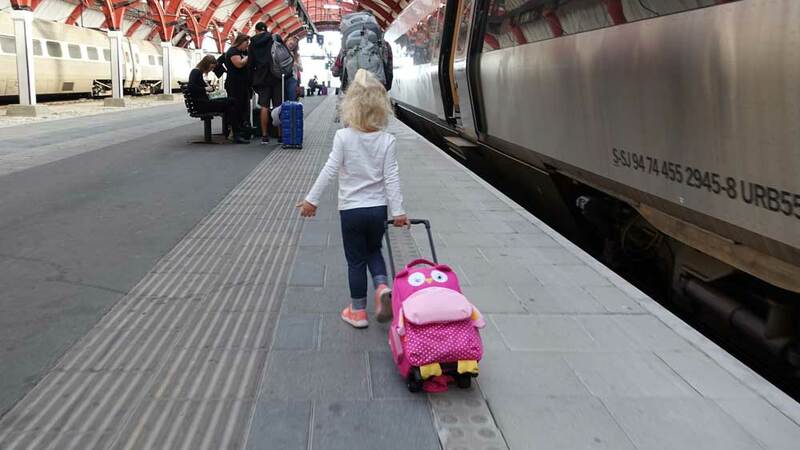 Toddlers are at the perfect age to truly start developing their unique interests and building upon those learning experiences they get during travel. Pretend play is important during this stage of development, and these travel gifts for kids ages 1 1/2 to 4 years old are perfect to help them expand their minds and develop a worldly perspective. What kid doesn’t like Fisher-Price Little People? The Travel Together Friend Ship is a great way to get your little person ready for a cruise or beach vacation. Heading to the mountains instead of the beach? The Going Camping Playset allows kiddos to build a pretend campsite with a tent , campfire, and sleeping bags. When your baby graduates to the toddler stage, the Travel Together Airplane will help them plan their pretend Little People trip. And for less than $10, this is the type of budget-friendly travels any parent can appreciate! LEGO is another popular brand for toddlers and older kids alike. And the DUPLO Around the World set includes an airplane, boat, and animals and people that represent different places from around the globe. The smaller, and more budget-friendly DUPLO Town Airport set is a great away to let your child explore the world of air travel through pretend play. People come in all different colors and so should toys. The World People set by LEGO is the perfect gift for kids to build awareness of diversity and teach children about embracing other cultures and celebrating differences. Our daughter has loved play food since she was about 1 1/2 years old. And when it comes to play food, Learning Resources makes the best, most realistic, and most cultural options on the market. Another great cultural food set for toddlers is the Melissa and Doug Sushi Slicing Set. We love sushi! Although my daughter doesn’t enjoy it yet, she loves to pretend to eat foods that mommy and daddy eat. This set is also great for preparing your child for a family trip to Japan. Introduce your toddler to geography, animals, and nature with this interactive talking globe from Educational Insights. The globe comes with a stylus pen that kids can use to touch the globe to learn fun, kid-friendly facts about the planet. These eight adorable plush toys representing cultures around the world make for perfect gifts for kids who travel, or are curious about the world. The dolls, which include Latin, Polynesian, American Indian, Eskimo, Asian, Indian, and Dutch people are soft, cuddly, and great companions on any trip. Music is a universal language, and nothing will connect your child more to other cultures than music. This Around the World pack includes instruments handmade by artisans in Africa, South America, and the South Pacific. The World Map Foam Floor Puzzle is another one of the great travel gifts for kids from Educational Insights. The 54 piece puzzle is perfect for older toddlers and young elementary school kids who are ready to move on from the 24 piece puzzles to something slightly more advanced. Much like the scratch off map that made our gift guide for dads, this poster lets you scratch off where you’ve been. But this map of the USA also includes fun facts about each state to help kids learn about all the places they’ve visited. Mattel makes so many great Barbie gifts for kids that inspire travel. From their Dolls of the World collection to their playsets that allow kids to take Barbie on a variety of adventures, these toys are sure to create hours of fun. Passport Barbie is ready for an adventure! Her bag is packed and she’s ready for jetsetting. Who knew Barbie flew carry on only?! Your young jetsetter will love the vacation jet, where Barbie and friends can travel in style on their way to or from a new adventure around the world. Does your family prefer cruises to air travel? No problem! Barbie can cruise, too! This cruise ship playset opens up to provide a world of amenities that Barbie will love. Perhaps your Barbie lover prefers a more low key travel style. Although Barbie won’t exactly be roughing it in this dream camper, she will have the freedom of traveling the open road and setting up camp wherever her heart desires. Barbie’s Dolls of the World collection are a great introduction to different countries and cultures. In traditional dresses representative of those countries, these dolls are perfect to play with or collect. Price varies. Thank you, Crayola, for recognizing people don’t all come in one or two shades and for creating a box of crayons of varying skin tones. This is a great, inexpensive travel gift for kids to color and draw beautifully diverse pictures of their friends and family. Shopkins are tiny collectable toys each with its own unique name and cute face. Luckily, the makers of these incredibly popular toys have a travel series that make for great travel gifts for kids. The World Vacation bundle includes a mega pack, 12 pack and 2 pack mystery box. That’s 34 Shopkins characters, plus a bonus set of stickers! Another great travel-inspired gift for kids is the Shopkins World Vacation Doll bundle. This particular bundle comes with three dolls representing Brazil, USA, and Mexico. Take your Shopkins and dolls on a pretend adventure around the world in this cute and colorful plane playset. The Oh La La Macaron Cafe will have your little traveler dreaming of a trip to Paris. Travel the world collecting souvenirs from vacation spots in Europe, Asia, Australia and the Americas. Obstacles like lost luggage and flight delays can cause setbacks, though. The first player to collect four souvenirs and return home wins! Your traveler’s favorite Shopkins doll will love this fun beach camper. It’s a perfect tie-in to the tiny home craze! LEGO is one of those brands that grow with your child. Here are a few travel-inspired LEGO sets for kids in grade school. Remember those days of lounging on a private catamaran while island hopping in the Greek isles? Yeah, me either. But your globetrotter can always dream, and this LEGO set will help them do just that! Traveling the world in an old camper van is probably a bit more budget-friendly than a private catamaran. So, if your child is a realist, this set might be more up their alley. The LEGO Friends Snow Resort Chalet and Ski Lift are both great sets for kids who love to ski. And the best part is, you don’t have to dress for the cold weather at this snow resort! This award-winning talking world map is another great way to teach geography to children and inspire a love for travel. You may keep your children’s passports put away somewhere for safe keeping, but they have a blast filling up these pretend passports with stickers and stamps. Who doesn’t love the feeling of a new passport stamp?! This set of 24 stampers includes a variety of popular countries from all over the world. It’s another great option for filling up the pages in your child’s pretend passport. It glows, it changes colors, and it levitates. This globe doesn’t get any cooler! It’s the perfect gift for a teenager’s desk. LEGO isn’t just for younger children, more complex sets make perfect travel gifts for kids in the 13-18 range. Even adults will enjoy building LEGO sets of their favorite places around the world. Here are two of our favorites. At only 321 pieces, the Eiffel Tower set is great for pre-teens and teenagers alike. It’s an easier (and way less expensive) option than the Tower Bridge. Teen girls who love travel will find this duvet set perfect for a travel-themed teen bedroom. Teenage boys who love travel may prefer this duvet set instead. These word search puzzles include landmarks, cities, and points of interest around the world. There is something great about a gift you can eat. And these edible gifts are even better because they are travel inspired! Let your child’s taste buds take a trip around the world, even during the times of the year you cannot. These awesome chocolate passports from Trader Joe’s are not only yummy, they’re travel themed! Japan is one of the most family-friendly destinations! And this candy box is just a small sampling of some of the awesome reasons we love Japan. If Europe is more your child’s taste, then this Taste of East Europe snack pack, with a combination of salty and sweet snacks, makes for a great travel gift for kids. 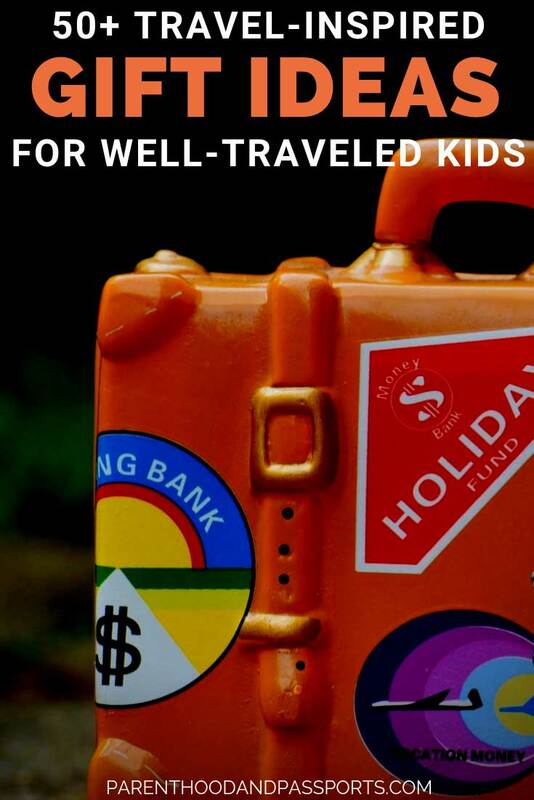 While most of the travel-inspired gifts on this list are great to play with or use at home, here are a few travel gifts for kids that are perfect take with you on your next family trip. Sleeping on a plane is never fun and never comfortable, but a neck pillow can definitely improve your odds of getting some quality shut eye. This cute, convertible neck pillow is a great companion on any trip as it easily folds up into a stuffed animal. A travel journal is a great way to document your child’s travels and encourage them to write down what they learned, saw, and experienced on a trip. This kids travel journal from Lonely Planet is perfect for kids who need additional prompting to help them craft their writing. When your young traveler graduates to a not-so-young traveler, this travel journal may be more their speed. It’s perfect for pre-teens and teenagers who love to travel. This fold up felt map is a great gift for entertaining toddlers on long flights or car trips. Kids can learn where each continent goes on the map and then identify the different animals from each continent. These headphones are great for little ones that can’t use ear buds and don’t like the feel of traditional headphones. They are super lightweight and pack up very small. Judge me all you want, but a tablet makes traveling long distances so much easier. We load ours up with our daughter’s favorite shows and a handful of educational, fun apps. This sleeping bag will get your little one excited for camping! It rolls up and stores neatly in it’s own carrying case to make it easy to take with you on the good. Whether it’s a bedroom or a playroom, travel-themed decor can make your child’s personal space into a cultural experience. We’ve had this set up in our daughter’s room since she was born. Now that she’s old it isn’t just a decoration, it’s also a fun toy. Is your little one afraid of the dark? Light up his or her room with this travel-inspired, Eiffel Tower Nightlight that will have them asleep and dreaming of Paris in no time. Bring the outdoors in with this fun canvas teepee. It not only makes for a nice reading nook or place to play, but it can easily serve as decor in a kid’s bedroom or playroom. Next time your teen tells you to get lost, tell them ok! This decal is perfect for the teen who has developed an attitude and love for travel. Reading is one of the best ways to inspire children and expand their minds. Here are a few books that will inspire your child to want to travel and see the world. These books make for great travel gifts for kids! The Kids who Travel the World is a series of books about two sisters who go on adventures around the globe. From Rome to Paris, London to Shanghai, these well-traveled sisters will have your traveler dreaming of his or her next trip! Perfect for older toddlers through grade school children. Molly and the Magic Suitcase is another fun book series that teaches children about different cities and countries. These books are great for young readers, ages kindergarten through third grade. Third and fourth grader readers will enjoy the Theodore’s Adventures series. Theodore is an adorable teddy bear that travels the world, sharing his experiences as he explores different places. Expand your child’s pallet by letting them make dinner. These easy kid-friendly recipes from around the world are great for your budding chef. This is an ideal travel gift idea for kids ages 9-12. Maisy is a beloved addition to our family. Toddlers will love the travel-themed books Maisy Goes on a Plane and Maisy Goes on Vacation. Have a question or comment about these travel gifts for kids? Leave a comment below!